For $1,000 in the category of douche bag teams that are mistakenly regarded as the class of Major League Baseball, the answer is: The idiot franchise that let a rapper diss them lyrically on their own field prior to a World Series game and later rewarded him with a championship ring. Question: Who are the New York Yankees? Correct! The Yankees invited Jay-Z and Alicia Keys to perform their single "Empire State of Mind" prior to game 2 of the World Series last year at Yankee Stadium. The track contains the lyric, "I made the Yankee hat more famous than a Yankee can." Yankees fans in attendance cheered. Firstly, the phrase is not true. Also, the Yankees should not have let that happen. If the front office wasn't aware of the lyric before the concert was booked, why didn't the players take exception at some point? 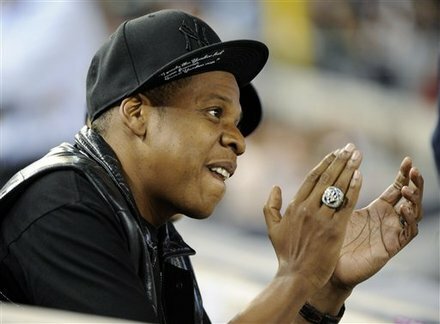 The team should be embarrassed for giving Jay-Z a World Championship ring after he clearly took credit for people buying their merchandise. And if you didn't notice in the above photograph, the inscription under the brim of Jay-Z's cap that he wore to Yankee Stadium this week, contains that questionable lyric "I made the Yankee hat more famous than a Yankee can." Yes, he's still making the absurd claim and the Yankees are still dumb enough to invite him into their home. The Yankees and their fans are clearly simple-minded to allow this embarrassment to continue. I don't believe that other organizations and their fans would be so moronic. It's no wonder a great majority of sports fans hate the Yankees. They aren't even bright enough to know when a celebrity takes a verbal crap on them. If a big-time Philadelphia musician made a similar claim about one of Philadelphia's teams, I assure you that he or she would be met with serious negative fan reactions, would no longer be held in the same regard and would forever damage his or her career. NEW YORK! These streets will make you feel brand new, big lights will inspire you...to look stupid in front of the whole world. For updates and unique stats, you can follow PhoulBallz.com on Twitter by clicking HERE. how does singing that song and saying that line make the Yankees an "idiot franchise"? you are obviously biased against the yankees, its just a song.. a song written by a cocky rapper.. thats it. gotta find some reason to shed a negative light on the yankees, thats original. I am not biased against any team. The song doesn't make the Yankees idiots. Rewarding a guy that disrespects the team, the front office and the fans does. Blindly defending your favorite team, that's original!